Diana, Princess of Wales, wore this white silk strapless dress encrusted with pearls and sequins, with a matching bolero jacket, in 1989. The Princess was a stylish public figure - her clothes made headlines and launched copycat styles. By the late 1980s, she favoured streamlined, well-cut garments such as this ensemble, which relies upon rich texture for its impact. Diana supported many London-based designers, such as Catherine Walker, the couturière from whom Diana ordered this ensemble. Walker first provided clothing for Diana during her first pregnancy in 1981, and continued to do so until Diana’s death in 1997. This outfit, which Diana called her ‘Elvis Dress’, was worn by the Princess to the British Fashion Awards in October 1989 and then on an official visit to Hong Kong. In 1997, Diana sold 79 dresses in a charity auction held by Christie's, which raised over 3 million pounds for AIDS and cancer charities. This dress was bought by The Franklin Mint, a company which produces memorablia such as a portrait Diana doll, featuring her wearing this dress, thus making it one of the best-known of Diana's many outfits. Slender strapless dress in white silk entirely covered in oyster pearls and sequins. Slender, ankle length skirt. Cropped bolero jacket with elbow length sleeves and stand-up collar, also covered with oyster pearls and sequins. Commissioned by Diana, Princess of Wales, from London-based couturiere, Catherine Walker, in 1989. The pearl and sequin embroidery was done by S. Lock Ltd.
Diana ordered this dress for a state visit to Hong Kong scheduled for November 1989. She first wore it to the British Fashion Awards in London in October 1989. In June 1997, Diana sold this outfit, along with 78 other items from her wardrobe, in a charity auction at Christie's. The auction raised £3.5 million pounds for AIDS and cancer charities. This particular dress was bought by The Franklin Mint, who subsequently donated it to the Museum in 2006. Historical significance: Diana, Princess of Wales was a significant style icon during the 1980s and 1990s, until her death in 1997. This is one of her most famous and iconic dresses, known popularly as the 'Elvis Dress', that was worn not just for an official visit to Hong Kong, but for the British Fashion Awards. In addition, she wore it for an official photograph. Following its purchase, The Franklin Mint produced a range of Diana souvenirs featuring her in the dress, including a portrait doll wearing a replica. This has served to further underline the dress's association with Diana. Along with her wedding dress, this is one of Diana's most famous and recognisable dresses. 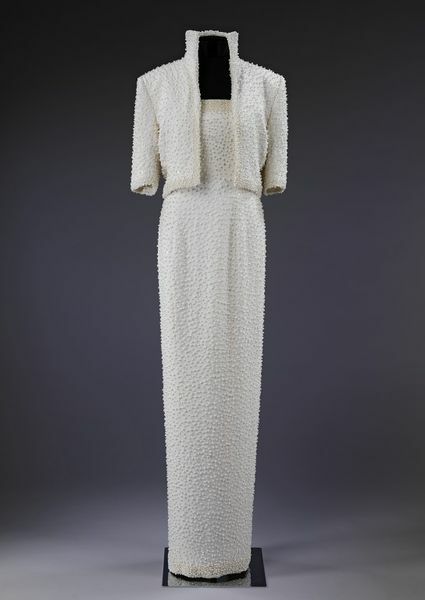 This white silk strapless dress encrusted with pearls and sequins, with a matching bolero jacket, was worn by Diana, Princess of Wales, in 1989. She first wore it in October 1989 to the British Fashion Awards, where she was guest of honour. The dress was then worn for an official visit to Hong Kong in November 1989. Diana called this her 'Elvis Dress', perhaps because the dramatic stand-up collar reminded her of the rock legend Elvis Presley. She also wore it for an official portrait photograph. Diana, Princess of Wales, was a major style icon of her time. Her wardrobe was often the subject of press and public interest. A particularly striking outfit could make headlines, and launch numerous copycat styles. In the late 1980s, Diana had developed a look that particularly suited her. She favoured streamlined, well-cut garments such as this ensemble, which relies upon rich texture for its impact. She was also known for patronising London-based designers, like Catherine Walker, the couturiere who made this outfit. This outfit was designed and made especially for Diana by Catherine Walker. Walker began making clothes for the Princess during Diana's first pregnancy in 1981. Their couturier-client relationship lasted for the rest of Diana's life, producing some of the most immediately recognisable looks in Diana's wardrobe. In 1997, shortly before her death, Diana sold 79 dresses in a charity auction held by Christie's. The proceeds of the auction - over 3 million pounds - went to AIDS and cancer charities. This dress was purchased by the American company, The Franklin Mint, who produced Diana memorablia featuring her wearing the dress, including a doll wearing a replica of the outfit. This has ensured that the 'Elvis Dress' remains amongst the most famous of Diana's many outfits. 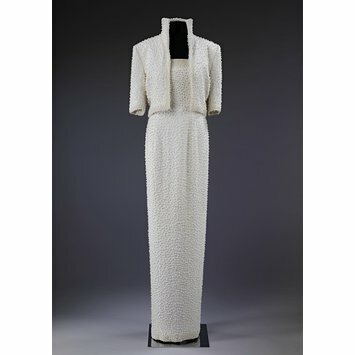 Evening ensemble worn by Diana, Princess of Wales, 1989. Designed by Catherine Walker.